From Alawar Games, comes the latest chapter in the thrilling House of 1000 Doors series! Emily’s everyday life is shattered when a strange woman knocks at her door, begging for her help as a frightening meteor descends from the sky. In an instant, she’s whisked away to the mysterious House of the Lancasters, where she discovers she has a special gift: the inner light. Now Emily’s power is the only thing that can stop the dark disease that threatens to swallow the entire world. This deadly infection corrupts anything it touches: humans, animals, even plants and inanimate objects, turning them into violent monsters. 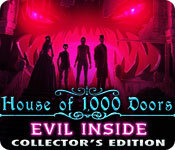 If you like House of 1000 Doors: Evil Inside Collector's Edition game, click to start House of 1000 Doors: Evil Inside Collector's Edition download. Sign-up to get informed when the House of 1000 Doors series has new game released with BD Studio Games' FREE bi-weekly newsletter.